Built in the early 1930’s, the New University was built by funds collected by then US Ambassador to Germany J.G. Schurman. This replaced an older building built in 1828 by Friedrich Weinbrenner. Above the entrance is a statue of Athena, Greek goddess of wisdom, with the caption “To the living spirit”. Incorporated into the building is a tower which is the only remaining part of the city wall. 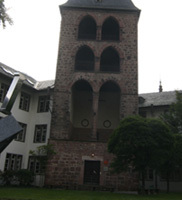 This tower is called the “Hexenturm”, because it was used during the Middle Ages to imprison supposed witches. It also served as a memorial to former students killed during World War I.